This image has a long history. It’s based on a photo I took in 1999 with a Fujitsu first generation digital camera. At some point I used Fractal design painter and a Wacom table to “paint” an oil style photo manipulation over the original photo. Through various computer and drive crashes I lost the original image and the painted version. I thought I had lost the image forever, however while cleaning out a stack of old computer media I found a CD labeled “cat calendar” and there on the CD was the image I had lost! The image was only 640 pixels across (large for 1999) and littered with jpg artifacts (since it was an over compressed version) so I loaded it up Photoshop CC 2014 and went to work. 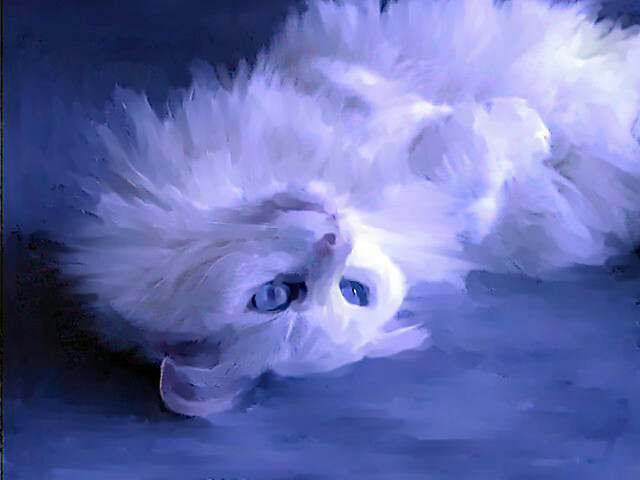 So I present to you White Cat Blue 2015. This entry was posted in Cats, Photo Manipulation on January 3, 2015 by eric.